The avalanche danger remains LOW above and below treeline. Though we have light snow showers on tap this afternoon, we are only likely to see a trace to an inch accumulate in the Eastern Turnagain Arm zone. Cool temperatures and crusts will keep the snow locked into place. In the off chance snowfall intensifies in a favored area and up to 6 inches fall by this afternoon, the danger will rise to MODERATE for loose snow avalanches and possibly shallow slabs. LOW danger does not mean NO danger. While avalanche activity is unlikely today, it is important to always use good travel practices. Join CNFAIC forecasters John Fitzgerald and Wendy Wagner at REI on Thursday night from 6-7:30pm for a presentation on this season's unusual weather, snow and avalanche cycles. This talk will get into the nitty-gritty of the impressive wet avalanche cycle in late January, discuss the unique snowpack we have seen this year and more. We look forward to seeing you there. To reserve a seat go to REI's website on this link - plus, it's FREE!! Normal caution is advised in the backcountry today. There has been no new avalanche activity for the past 4 days. The latest activity was between February 26 and 28th when a warm-up and 0.2" of rain triggered several small wet loose avalanches and, in the periphery of the forecast zone, a few wet slab avalanches. This warm-up capped our pack with a 1-4+" inch crust and began a several day melt-freeze cycle. With cold temperatures and cloud cover today, the pack will remain locked-up and frozen. In anticipation of snowfall this week, it's important to take inventory of the surface conditions. Above the melt-freeze crust that caps the snowpack is a healthy layer of surface hoar which formed two nights ago (photo below and more details HERE). This is an ideal weak layer/bed surface combination and something to watch for if more than just a few inches of snow accumulates in the next few days. For today however, there is not enough snow in the cards. Persistent slabs in steep high elevation terrain on the periphery of the forecast zone and in outlying areas. 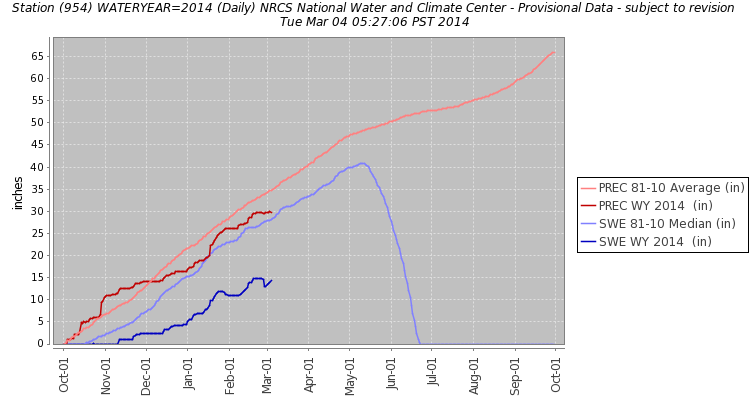 We have a generally poor snowpack structure at this elevation. 1-3' below the degrading surface crusts is a weak layer of facets sitting on, and in between, the January crusts. These faceted layers have not been reactive of late but still exist. It will be remotely possible to trigger an avalanche in very steep terrain. Yesterday's cooling temperatures, shifting winds and mid-level clouds were the first sign of a change in the weather. During the past 24-hours temperatures have averaged in the low 20's at the ridgetop weather stations and are sitting in the teens this morning. Winds have shifted from the Northwest to the Southeast overnight and continue to be light around 5mph. A cold front is sliding down for the Northeast and joining with a weak low centered over us currently. Very light snow showers are in the forecast for today into Thursday. Only around a trace to an inch is expected by this evening. Temperatures look to remain in the teens on the ridgetops and near 30F at 1,000' (cold enough that snow might make it to sea level). Winds are expected to pick up slightly to 10-15mph from the Southeast. Beginning late tonight and through Wednesday we should see temperatures remain just cold enough for snow to sea level with 2-5" possible. Snow should taper off Thursday. Stay tuned.